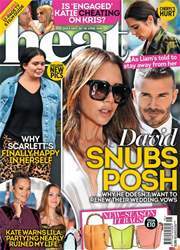 "In this week's issue – love is in the air as Joey and Sam finally go public and Kourtney and Scott get engaged! Plus, there are spats aplenty as Posh 'bans' Mel C from her birthday and Jessie J lashes out at The Voice! Miaow."